Home Body Disorders Stress And Your Health – How Are They Related? Stress, as we know, is a reaction to a stimulus/situation that disturbs your mental or physical equilibrium. Stress is an unavoidable part of life and is mostly caused by a change in the physical or an emotional status, or a change in your surrounding or environment, that requires you to respond or adjust. Things or circumstances that cause stress are called "stressors." These can be minor hassles or disputes, major lifestyle changes (physical, behavioral, or emotional), or a combination of both. Since stress can occur due to any worry or incident and is sure to affect the normal functioning of the mind and the body. 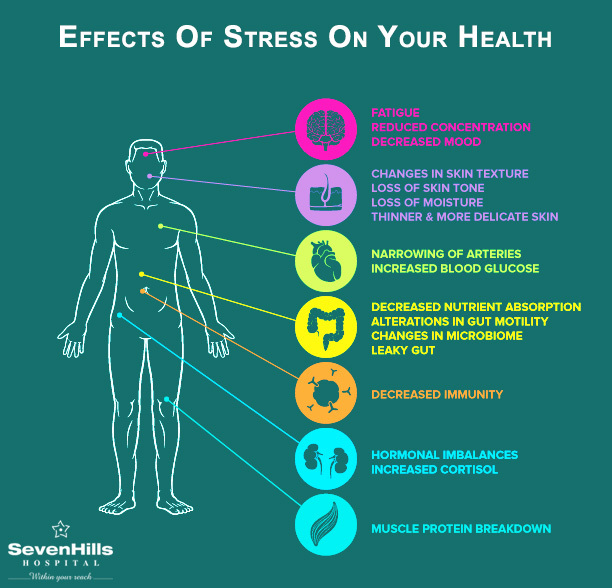 Prolonged stress is as harmful as any major disease as it can cause chronic fever, heart attack, diabetes, depression, cancer, insomnia, hair fall, weight loss, and even more! Primarily, it has a direct effect on your skin and affects the way you look. This can mar your personality and can kill your confidence even before you fall prey to major health diseases. How Stress Affects Your Skin? 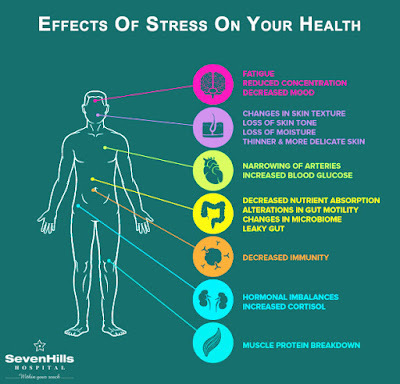 Stress causes a chemical imbalance in your body that makes your skin more sensitive and reactive, makes it difficult for skin problems to heal, and produces more oils. Oily skin is more susceptible to acne, pimples, and other skin problems. So How Do You Deal With Stress? Take care of your skin by washing it, scrubbing it, and moisturizing it. Do something you enjoy as doing this will indirectly reduce stress and will keep you happy. Practice stress management techniques, such as meditation, yoga, breathing exercises, jogging or walking, etc. Get enough sleep of seven to eight hours each night. Say no to set limits and boundaries to lower your stress. You don’t need to give in every single time. Speak to a friend or a professional. This will help in reducing your stress and will help you recover faster.